In Typical ‘Lean Startup’ fashion, we’re launching theJobSpectrum™ survey as quickly as possible. Because we were able to build a working survey and imbed it into our site without the programming we thought we needed, we can have Participants take the survey and start building up the ‘Manufactured Data—With Meaning™’ way ahead of schedule. 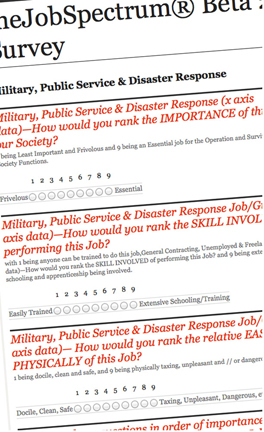 When we are able to program the Survey ourselves, it will look and behave much differently. But for now, this gives you a working, functional model that can give Participants, Potential Advertisers, Partners, Investors and the Curious a way to absorb what this ‘Jobs of the Future’ Mechanism can do. This ability will, in turn, enable us to start to build our database and test the functionality of how our unique business model will work and succeed. 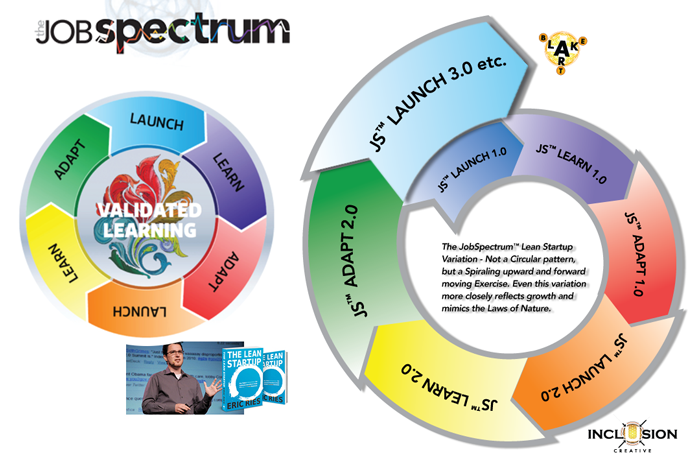 The initial JobSpectrum™ Ran from October 21st, 2013 to February 22, 2014. The results are posted within our Website – you can view the Ranking Results Here, and you can check out how we would distribute a Sample Ad Revenue Monthly Tally Here. Be on the lookout for more updates – will also be launching a social media campaign to support these initial JobSpectrum™ reports and results. If you are participating in these first steps of this new Business Endeavor// New Economy // Job of the Future // Art Installation, on behalf of all of us here at theJobSpectrum.com, thank you!